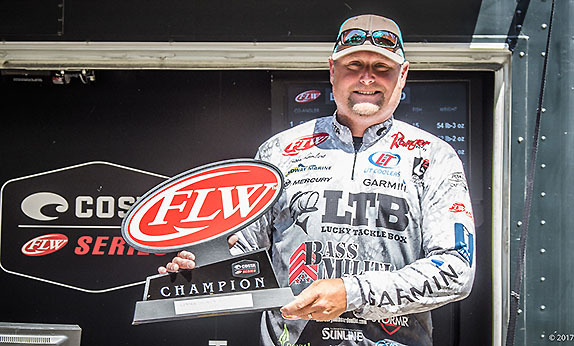 Jason Lambert averaged just under 21 pounds per day en route to winning the Kentucky Lake Central FLW Series. There have been years when Jason Lambert performed quite well on the points list while competing on a high-level circuit. 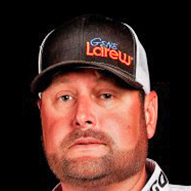 He ended up 21st in the Angler of the Year race in his first season on the FLW Tour in 2014 and has 2nd- and 3rd-place points showings on his FLW Series ledger. In more recent seasons, however, the big Tennessean has become a guy who bombs frequently, but wins more than his share � particularly on venues dominated by ledge-fish. He's finished 100th or lower in five of the last six Tour events, but over the weekend he notched his third victory (two on the Series, one on the Tour) since the beginning of 2016. Almost a year to the day after capturing his initial Tour triumph at Kentucky Lake, he won the Central Division Series derby there. His 71-10 haul over 3 days garnered him a prize package valued at more than $97,000. It also took a lot of the sting out of his 139th-place standing in the Tour Angler of the Year (AOY) race with only this week's tournament at the Potomac River remaining on the regular-season schedule. "A hundred grand fixes a lot of problems," he said. "With a 210-boat field, it's a pretty good return on investment for a $1,600 entry fee. That's what makes the (Series) such an attractive circuit to fish. "The way I fish, I've kind of proven that I can win � my record when I get those opportunities is pretty decent. I need to do a little better with some aspects of fishing because I've missed some opportunities for sure, but I'd be happy if I never made another (Forrest Wood) Cup if I could win one of these every year. You get more exposure and more money than you do by making seven checks on the Tour." Lambert said the Kentucky Lake fish are a bit behind this year in their annual migration to the ledges. He attributes that to all of the rain the region experienced this spring, which has resulted in dramatic water fluctuations in terms of both level and temperature. He'd fished the northern end of the massive Tennessee River impoundment on past visits, but not to the extent that he did this time. Avoiding crowds was his primary motivation for that decision. "The lake fished smaller than before because it was so far behind," he said. "There were some fish out (on the drop-offs), but not as many. I wasn't finding as many schools, and there weren't as many fish in those schools. "Plus, there were a couple of big tournaments down south � a Strike King event and an ABA out of Paris. Putting an additional 220 boats or so on the lower end was going to constrict it even further." He pinpointed 25 to 30 schools that contained quality during practice, with more than half of those in the north end. He was able to exploit about 15 of them during the tournament. Plying depths down to 27 feet, his primary offering was a Castaic Jerky J swimbait (green shad) attached to a 3/4-ounce Hog Farmer Hog Wobbler jighead. He also scored with a crankabit (6th Sense Cloud 9 Series C25 in sexified shad) and a Gene Larew TattleTail worm on a 3/4-ounce football-head jig. Lambert, who weighed bags that registered 25-02, 24-00 and 22-08, led the tournament from start to finish. He edged runner-up Cole Floyd by 7 ounces. "I knew it was going to be tight because I knew the weights would be down on the last day," he said. "It was pretty much a three-man race � me, Cole and (eventual 4th-place finisher Micah Frazier) were about 4 pounds in front of everybody else." He compiled the majority of his final-day bag before 9 o'clock. He made a single cull for about half a pound at 1:30. "At the weigh-in, I felt like I had enough, but it was nerve-wracking when they called (Floyd's) weight. After that I knew it was going to be extremely close � I just didn't know how close." His biggest fish of the event was a 6-02 that he caught on day 2. He'd missed one just a couple of casts earlier that he deemed bigger than that. "If I'd have caught that fish, (the final margin) wouldn't have been that close. It would've been about a 2 1/2-pound cull." On Sunday, he made the 14-hour drive from Gilbertsville, Ky. to the nation's capital for the Tour finale. He turned in a strong finish at the Potomac (18th) in 2015. With no chance to qualify for the Cup and no real pressure to earn a paycheck, he can fish free and easy. "I'll just go out and settle into some grass and see what I can do." "The Harris Chain is a place that's never been really good to me." "My wife allows me to fish, so when I'm not fishing, I pretty much just do whatever she tells me to." "Being an athlete since I was a kid, I'd say the competition is the most attractive part of it. That and you're not in an office every day."